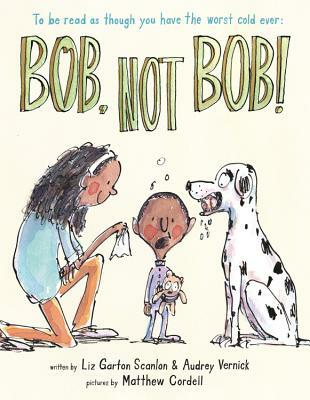 As Louie tries and tries to make himself understood in this funny picturebook, kids will love calling out with him, "Bob, not Bob!" Liz Garton Scanlon (http://lizgartonscanlon.com/) is the author of many beloved children's books, including All the World, illustrated by Marla Frazee, which won a Caldecott Honor, and her debut middle-grade novel The Great Good Summer. She lives with her family in Austin, Texas. She's all grown up now, but sometimes when she's sick she still wants her "bob." Audrey Vernick is the author of twenty books for young readers, including Unlike Other Monsters, Is Your Buffalo Ready for Kindergarten? and First Grade Dropout. When she feels drippy and gross, she likes to snuggle with her dog, who is not named Bob. Visit her online at www.audreyvernick.com.